Thousands of illicit cigarettes and a quantity of hand rolling tobacco have been seized from Staffordshire shops during a December operation. Staffordshire County Council trading standards officers, aided by sniffer dogs, raided shops in Tamworth, Rugeley and Burton in recent weeks. The premises were targeted as part of an intelligence-led operation to tackle illicit tobacco sales. In total, they found approximately 33,000 cigarettes, believed to be counterfeit or illegal, over 8kg of illegal hand rolling tobacco, 13 litres of suspected non-duty paid vodka and approximately £1,000 cash. It is the latest in a series of countywide visits by the trading standards team. Trading standards officers, who were supported by Staffordshire Police, are now considering further enforcement action. Cigarettes uncovered are thought to have been illegally imported and previously supplied at the shops. The tobacco was often well hidden in concealments in cavity walls and within ceilings of the shops. These would be difficult to detect without the aid of specialist tobacco sniffer dogs. Staffordshire County Council’s communities leader Gill Heath said: “Our trading standards team responded to intelligence and successfully disrupted the supply of potentially dangerous tobacco and cigarettes in Staffordshire. This is part of our ongoing operation to tackle the sale of illicit and counterfeit tobacco. “Counterfeit sales also damage businesses and can fund criminal gangs. We are always grateful to people who report suspected sales of illicit tobacco – the information they give really can make a difference. Gill added: “Counterfeit tobacco is damaging to people’s health and can undermine smoking cessation efforts as it is usually sold at a cheaper price. In addition, illicit cigarettes can be a fire risk as they do not self-extinguish when left to burn as legitimate cigarettes do. Stuart Phillips, from BWY Canine Ltd which provided some of the dogs used in the operation, said: “Tobacco detection dogs are the most accurate, reliable and quickest way of locating hidden illegal tobacco products. 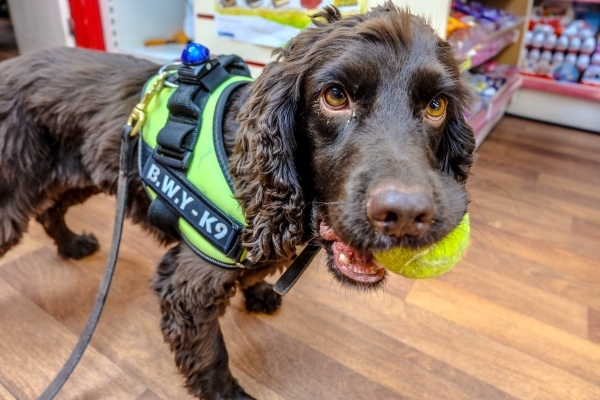 “In the last five years our dogs Yoyo, Scamp and Phoebe have located over £12 million worth of illegal tobacco with over 104 trading standards teams across the UK. Collin Singer, managing director of Wagtail UK Ltd which also provided detection dogs, said: “Sniffer dogs remain the quickest and most effective method of detected a scent. Wagtail UK is delighted to have assisted Staffordshire County Council’s trading standards team in another successful illegal tobacco enforcement operation.